There is a 26 foot tall dinosaur located between the ninth green and 10th tee of the Sunshine Coast Resort Course in South Queensland on Australia’s north eastern coast. It moves and it roars and it has apparently scared off the Australian PGA which has been holding their yearly championships there for the past 11 years. But that was before the T Rex arrived. These days, local golfers jokingly take “dinosaur mulligans” when the mechanical monster let’s go a roar when they are in the middle of a backswing on the 10th tee. And more dinosaurs are coming. The giant extinct lizard is the brainchild of eccentric billionaire Clive Palmer whose long term plans call for bringing in a whole herd of prehistoric critters and turning the whole place into a theme park and casino. Maybe they can figure out a way for gamblers to place wagers on the robotic dinosaurs. The resort is located near Coolum on what is known as the gold coast or the sunshine coast just north of Brisbane and has proved to be a popular venue for professional and amateur golfers for many years now. 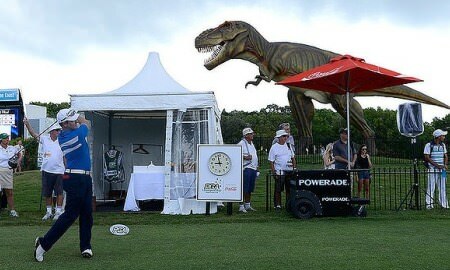 However, with the arrival of Tyrannosaurus Rex, the Australian PGA has said “too much” and announced that next years’ event will be held elsewhere. The tournament this year will feature 2011 British Open Champion Darren Clarke, Adam Scott, Peter Senior and Greg Norman. This was the first PGA event to be held on the Sunshine Coast Resort course since Palmer acquired the property last year….and it now looks like it will be the last. Golfers started complaining first when Palmers company began putting up advertizing signs all around the golf course. The signs were distracting and represented just the kind of thing that people came to a place like the resort to get away from. Some of the signs were placed in some landing areas forcing tourney organizers to make some of these areas “ground under repair” zones where golfers will be able to move the ball if it lands there. Actually the automated T Rex is nicknamed “Jeff” is movement activated. When anyone approaches its tail flips up in the air and its mouth opens wide in a loud roar. Who wouldn’t want one of those on their golf course? Perhaps next Mr. Palmer will invite Bob Barker and Happy Gilmore down to Australia for a couple of rounds, just for a laugh.